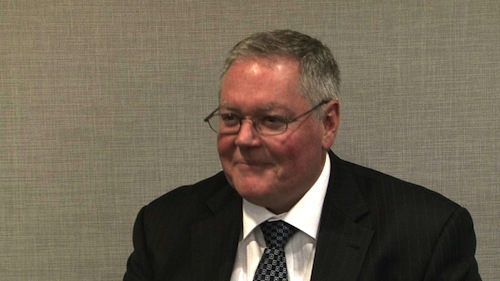 Financial Service Council (FSC) CEO John Borgden has highlighted the severe pressures that FoFA is placing on the independent adviser market and has described their future as “very marginal”. “The changes in FoFA really have squeezed the independent financial adviser market. There’s real pressure on the small independent advice businesses from the cost of compliance alone,” he said at a Sydney media briefing yesterday. The comments came after the release of the FSC-DST Global Solutions CEO report, which surveyed Australia’s leading CEOs across the $1.9 trillion wealth management industry. The survey found that too much regulation was a leading concern in the industry, along with low consumer confidence and poor investment returns. New regulations are seen as inhibiting productivity and innovation. “Our CEOs believe the latest round of changes have taken the workplace relations back 20 or 30 years,” said Brogden. The impact on financial services was not the only concern on their minds. The future of the broader Australian economy, too, was a major issue. The CEOs questioned Australia’s tax system, with 98% saying it’s more complex than it needs to be and 78% saying it was impeding productivity. “Effective tax policy is a key future driver of Australia’s productivity growth,” said Brogden. Australia’s ageing population was also a concern for the CEOs: Seventy-one per cent of weren’t confident that Australia had adequate private savings levels. More regulation is only introduced when things go wrong and you will never weed out those wannabes who want to become over night millionaires. So the profession in itself is more vital then ever its the need to change the existing business models is what is causing the current issues in 2012, as many in the industry just continue to do the same thing day after day hoping for a different result. Clients have just got smarter and technology is providing them with so many more alternatives, so the answer to change to meet today's clients needs is?